A new Nielsen report reveals that when it comes to content platforms, radio is No.1 for black and Hispanic consumers. Nielsen’s Audio Today report analyzes the audio habits of black and Hispanic audiences. 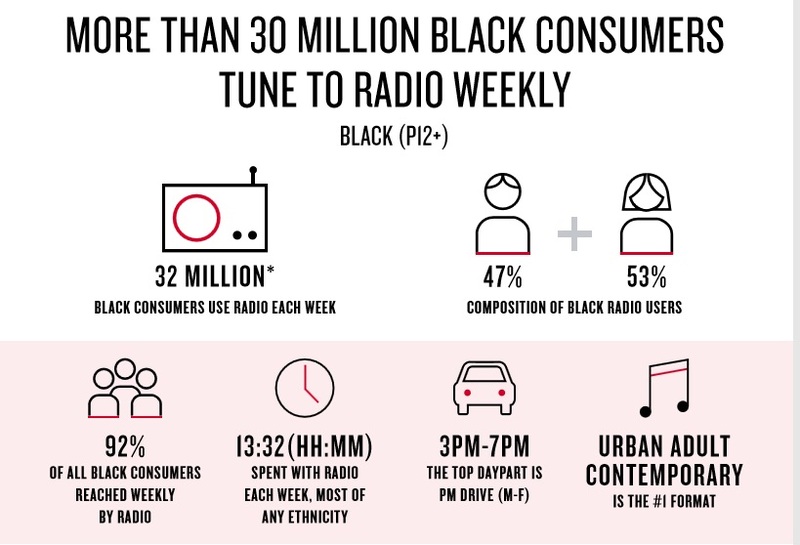 It found over 75 million black and Hispanic listeners tune-in to radio each week; that’s a breakdown of 92% of black consumers and 96% of Hispanics. Surprisingly, perhaps, radio is more of what is referred to in the report as a “reach vehicle” than the smartphone. For 81% of blacks and 80% of Hispanics, their smartphone serves as their main device for consuming audio content. Another interesting revelation—blacks and Hispanics are more likely to use smart speakers and audio streaming services than white consumers. Nineteen percent of blacks versus 18% of whites have a smart speaker in their household. Smart speakers can range from Bluetooth devices from vendors such as JBL and Sony; to smart home assistants such as Google Home and the Apple Homepod. Fifty-two percent of blacks use audio streaming services including Spotify, iHeartRadio, TuneIn, Pandora, Apple Music, Soundcloud, etc., versus 40% of whites. The report also delves deeper into black people’s radio habits. On average, blacks listen to 13 hours and 32 minutes of radio per week. Most of that listening is done from 3 PM–7 PM, Monday–Friday during the work commute home. Overall, urban adult contemporary is the No. 1 radio format listened to by blacks in all age groups. Generation Z and millennials favor urban contemporary over all other formats. The top five advertisers vying the most for the ears of black consumers are McDonald’s at No. 1, and then Comcast Xfinity, Optima Tax Relief, T-Mobile, and Metro PCS, respectively. Black wealth has also been made via radio. Berry Gordy created what was one of the nation’s largest black businesses for many years as well as the careers of iconic music stars with the Motown sound. And Cathy Hughes took Radio One and built it into a multimedia empire, Urban One Inc. with annual revenues of more than $400 million. The post Report: Nope, Not the Smartphone. Radio Is No. 1 Audio Platform for Black People appeared first on Black Enterprise.